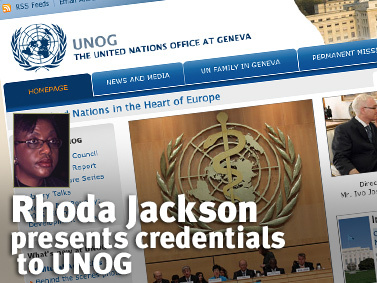 Rhoda Jackson presented her credentials in Geneva May 24, assuming her position as Ambassador Extraordinary and Plenipotentiary and Permanent Representative of the Commonwealth of The Bahamas to the United Nations Office and other International Organizations in Geneva. Rhoda Jackson presented her credentials to Kassym-Jomart Tokayev, director general of the United Nations Office in Geneva, accrediting her as Ambassador Extraordinary and Plenipotentiary and Permanent Representative of the Commonwealth of The Bahamas to the United Nations Office and other International Organizations in Geneva, May 24, 2013. At the ceremony, the director general welcomed Ambassador Jackson to Geneva, underscoring that the Geneva post was an extremely active one as critical global issues are addressed by the various specialized agencies resident in Geneva. He noted that her past experience at The Bahamas Mission to the United Nations, New York, should serve her well in this post. Ambassador Jackson thanked him for the warm welcome and noted that the opening of the Bahamas Permanent Mission was not only a milestone for her, but also for the Commonwealth of The Bahamas. Given the importance of Geneva, particularly with respect to the seat of the World Trade Organization (WTO), the Ambassador reiterated the significance of The Bahamas’ presence, as it seeks to advance The Bahamas’ accession to the WTO and follow closely other matters of interest to the government of The Bahamas. The Ambassador was accompanied by third secretary, Granville Butler. The Bahamas Permanent Mission opened its doors in Geneva May 21, 2013. Ambassador Elliston Rahming has been chosen to lead the Bahamian delegation to the Organization of American States’ 43rd annual General Assembly in Antigua, Guatemala, June 3-7, 2013. Royal Caribbean International announced today that the May 31, 2013 sailing of Grandeur of the Seas from Baltimore, Maryland, will be cancelled to allow for repairs to damages sustained as a result of a fire. Guests booked on the May 31 sailing will be provided a full refund of the cruise fare paid for their sailing. 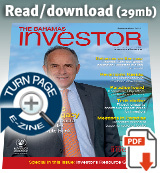 Repairs to sustained fire damage to take place at Freeport.